We, the Hindu inhabitants of Calcutta and of several other places in Bengal, offer you on your return to the land of your birth a hearty welcome. We do so with a sense of pride as well as of gratitude, for by your noble work and example in various parts of the world you have done honour not only to our religion but also to our country and to our province in particular. At the great Parliament of Religions which constituted a Section of the World's Fair held in Chicago in 1893, you presented the principles of the Aryan religion. The substance of your exposition was to most of your audience a revelation, and its manner overpowering alike by its grace and its strength. Some may have received it in a questioning spirit, a few may have criticised it, but its general effect was a revolution in the religious ideas of a large section of cultivated Americans. A new light had dawned on their mind, and with their accustomed earnestness and love of truth they determined to take fun advantage of it. Your opportunities widened; your work grew. You had to meet call after call from many cities in many States, answer many queries, satisfy many doubts, solve many difficulties. You did an this work with energy, ability, and sincerity; and it has led to lasting results. 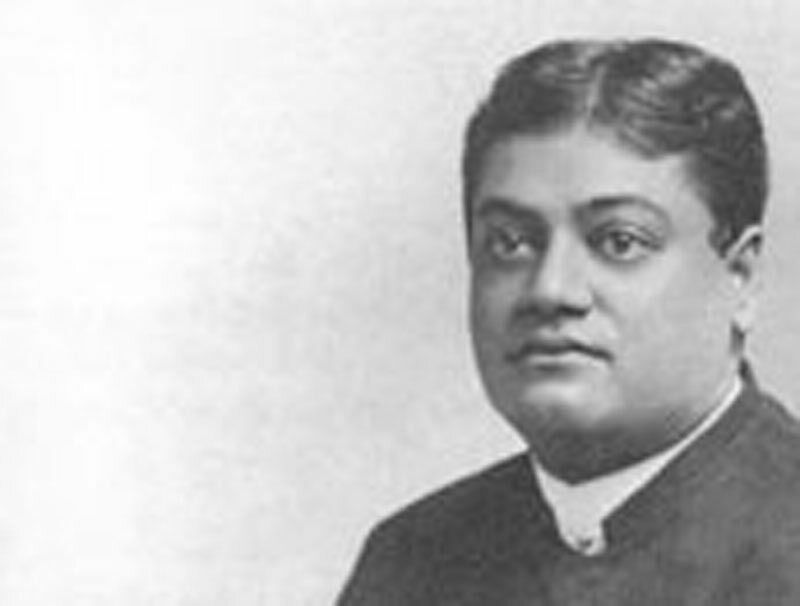 Your teaching has deeply influenced many an enlightened circle in the American Commonwealth, has stimulated thought and research, and has in many instances definitely altered religious conceptions in the direction of an increased appreciation of Hindu ideals. The rapid growth of clubs and societies for the comparative study of religions and the investigation of spiritual truth is witness to your labour in the far West. You may be regarded as the founder of a College in London for the teaching of the Vedanta philosophy. Your lectures have been regularly delivered, punctually attended, and widely appreciated. Their influence has extended beyond the walls of the lecture-rooms. The love and esteem which have been evoked by your teaching are evidenced by the warm acknowledgements, in the address presented to you on the eve of your departure from London, by the students of the Vedanta philosophy in that town. Your success as a teacher has been due not only to your deep and intimate acquaintance with the truths of the Aryan religion and your skill in exposition by speech and writing, but also, and largely, to your personality. Your lectures, your essays, and your books have high merits, spiritual and literary, and they could not but produce their effect. But it has been heightened in a manner that defies expression by the example of your simple, sincere, self-denying life, your modesty, devotion, and earnestness. While acknowledging your services as a teacher of the sublime truths of our religion, we feel that we must render a tribute to the memory of your revered preceptor, Shri Ramakrishna Paramahamsa. To him we largely owe even you. With his rare magical insight he early discovered the heavenly spark in you and predicted for you a career which happily is now in course of realisation. He it was that unsealed the vision and the faculty divine with which God had blessed you, gave to your thoughts and aspirations the bent that was awaiting the holy touch, and aided your pursuits in the region of the unseen. His most precious legacy to posterity was yourself. Go on, noble soul, working steadily and valiantly in the path you have chosen. You have a world to conquer. You have to interpret and vindicate the religion of the Hindus to the ignorant, the sceptical, the wilfully blind. You have begun the work in a spirit which commands our admiration, and have already achieved a success to which many lands bear witness. But a great deal yet remains to be done; and our own country, or rather we should say your own country, waits on you. The truths of the Hindu religion have to be expounded to large numbers of Hindus themselves. Brace yourself then for the grand exertion. We have confidence in you and in the righteousness of our cause. Our national religion seeks to win no material triumphs. Its purposes are spiritual; its weapon is a truth which is hidden away from material eyes and yields only to the reflective reason. Call on the world, and where necessary, on Hindus themselves, to open the inner eye, to transcend the senses, to read rightly the sacred books, to face the supreme reality, and realise their position and destiny as men. No one is better fitted than yourself to give the awakening or make the call, and we can only assure you of our hearty sympathy and loyal co-operation in that work which is apparently your mission ordained by Heaven. Your loving FRIENDS AND ADMIRERS. One wants to lose the individual in the universal, one renounces, flies off, and tries to cut himself off from all associations of the body of the past, one works hard to forget even that he is a man; yet, in the nears of his heart, there is a soft sound, one string vibrating, one whisper, which tells him, East or West, home is best. Citizens of the capital of this Empire, before you I stand, not as a Sannyasin, no, not even as a preacher, but I come before you the same Calcutta boy to talk to you as I used to do. Ay, I would like to sit in the dust of the streets of this city, and, with the freedom of childhood, open my mind to you, my brothers. Accept, therefore, my heartfelt thanks for this unique word that you have used, "Brother". Yes, I am your brother, and you are my brothers. I was asked by an English friend on the eve of my departure, "Swami, how do you like now your motherland after four years' experience of the luxurious, glorious, powerful West?" I could only answer, "India I loved before I came away. Now the very dust of India has become holy to me, the very air is now to me holy; it is now the holy land, the place of pilgrimage, the Tirtha." Citizens of Calcutta — my brothers — I cannot express my gratitude to you for the kindness you have shown, or rather I should not thank you at all, for you are my brothers, you have done only a brother's duty, ay, only a Hindu brother's duty; for such family ties, such relationships, such love exist nowhere beyond the bounds of this motherland of ours. The Parliament of Religions was a great affair, no doubt. From various cities of this land, we have thanked the gentlemen who organised the meeting, and they deserved all our thanks for the kindness that has been shown to us; but yet allow me to construe for you the history of the Parliament of Religions. They wanted a horse, and they wanted to ride it. There were people there who wanted to make it a heathen show, but it was ordained otherwise; it could not help being so. Most of them were kind, but we have thanked them enough. On the other hand, my mission in America was not to the Parliament of Religions. That was only something by the way, it was only an opening, an opportunity, and for that we are very thankful to the members of the Parliament; but really, our thanks are due to the great people of the United States, the American nation, the warm hearted, hospitable, great nation of America, where more than anywhere else the feeling of brotherhood has been developed. An American meets you for five minutes on board a train, and you are his friend, and the next moment he invites you as a guest to his home and opens the secret of his whole living there. That is the character of the American race, and we highly appreciate it. Their kindness to me is past all narration, it would take me years yet to tell you how I have been treated by them most kindly and most wonderfully. So are our thanks due to the other nation on the other side of the Atlantic. No one ever landed on English soil with more hatred in his heart for a race than I did for the English, and on this platform are present English friends who can bear witness to the fact; but the more I lived among them and saw how the machine was working — the English national life — and mixed with them, I found where the heartbeat of the nation was, and the more I loved them. There is none among you here present, my brothers, who loves the English people more than I do now. You have to see what is going on there, and you have to mix with them. As the philosophy, our national philosophy of the Vedanta, has summarised all misfortune, all misery, as coming from that one cause, ignorance, herein also we must understand that the difficulties that arise between us and the English people are mostly due to that ignorance; we do not know them, they do not know us. Unfortunately, to the Western mind, spirituality, nay, even morality, is eternally connected with worldly prosperity; and as soon as an Englishman or any other Western man lands on our soil and finds a land of poverty and of misery, he forthwith concludes that there cannot be any religion here, there cannot be any morality even. His own experience is true. In Europe, owing to the inclemency of the climate and many other circumstances poverty and sin go together, but not so in India. In India on the other hand, my experience is that the poorer the man the better he is in point of morality. Now this takes time to understand, and how many foreign people are there who will stop to understand this, the very secret of national existence in India? Few are there who will have the patience to study the nation and understand. Here and here alone, is the only race where poverty does not mean crime, poverty does not mean sin; and here is the only race where not only poverty does not mean crime but poverty has been deified, and the beggar's garb is the garb of the highest in the land. On the other hand, we have also similarly, patiently to study the social institutions of the West and not rush into mad judgments about them Their intermingling of the sexes, their different customs their manners, have all their meaning, have all their grand sides, if you have the patience to study them. Not that I mean that we are going to borrow their manners and customs, not that they are going to borrow ours, for the manners and customs of each race are the outcome of centuries of patient growth in that race, and each one has a deep meaning behind it; and, therefore, neither are they to ridicule our manners and customs, nor we theirs. Again, I want to make another statement before this assembly. My work in England has been more satisfactory to me than my work in America. The bold, brave and steady Englishman, if I may use the expression, with his skull a little thicker than those of other people — if he has once an idea put into his brain, it never comes out; and the immense practicality and energy of the race makes it sprout up and immediately bear fruit. It is not so in any other country. That immense practicality, that immense vitality of the race, you do not see anywhere else. There is less of imagination, but more of work, and who knows the well-spring, the mainspring of the English heart? How much of imagination and of feeling is there! They are a nation of heroes, they are the true Kshatriyas; their education is to hide their feelings and never to show them. From their childhood they have been educated up to that. Seldom will you find an Englishman manifesting feeling, nay, even an Englishwoman. I have seen Englishwomen go to work and do deeds which would stagger the bravest of Bengalis to follow. But with all this heroic superstructure, behind this covering of the fighter, there is a deep spring of feeling in the English heart. If you once know how to reach it, if you get there, if you have personal contact and mix with him, he will open his heart, he is your friend for ever, he is your servant. Therefore in my opinion, my work in England has been more satisfactory than anywhere else. I firmly believe that if I should die tomorrow the work in England would not die, but would go on expanding all the time. "Whenever, O descendant of Bharata, there is decline of Dharma, and rise of Adharma, then I body Myself forth. For the protection of the good, for the destruction of the wicked, and for the establishment of Dharma I come into being in every age." Along with this you have to understand one thing more. Such a thing is before us today. Before one of these tidal waves of spirituality comes, there are whirlpools of lesser manifestation all over society. One of these comes up, at first unknown, unperceived, and unthought of, assuming proportion, swallowing, as it were, and assimilating all the other little whirlpools, becoming immense, becoming a tidal wave, and falling upon society with a power which none can resist. Such is happening before us. If you have eyes, you will see it. If your heart is open, you will receive it. If you are truth-seekers, you will find it. Blind, blind indeed is the man who does not see the signs of the day! Ay, this boy born of poor Brahmin parents in an out-of-the-way village of which very few of you have even heard, is literally being worshipped in lands which have been fulminating against heathen worship for centuries. Whose power is it? Is it mine or yours? It is none else than the power which was manifested here as Ramakrishna Paramahamsa. For, you and I, and sages and prophets, nay, even Incarnations, the whole universe, are but manifestations of power more or less individualized, more or less concentrated. Here has been a manifestation of an immense power, just the very beginning of whose workings we are seeing, and before this generation passes away, you will see more wonderful workings of that power. It has come just in time for the regeneration of India, for we forget from time to time the vital power that must always work in India. Each nation has its own peculiar method of work. Some work through politics, some through social reforms, some through other lines. With us, religion is the only ground along which we can move. The Englishman can understand even religion through politics. Perhaps the American can understand even religion through social reforms. But the Hindu can understand even politics when it is given through religion; sociology must come through religion, everything must come through religion. For that is the theme, the rest are the variations in the national life-music. And that was in danger. It seemed that we were going to change this theme in our national life, that we were going to exchange the backbone of our existence, as it were, that we were trying to replace a spiritual by a political backbone. And if we could have succeeded, the result would have been annihilation. But it was not to be. So this power became manifest. I do not care in what light you understand this great sage, it matters not how much respect you pay to him, but I challenge you face to face with the fact that here is a manifestation of the most marvellous power that has been for several centuries in India, and it is your duty, as Hindus, to study this power, to find what has been done for the regeneration, for the good of India, and for the good of the whole human race through it. Ay, long before ideas of universal religion and brotherly feeling between different sects were mooted and discussed in any country in the world, here, in sight of this city, had been living a man whose whole life was a Parliament of Religions as it should be. The highest ideal in our scriptures is the impersonal, and would to God everyone of us here were high enough to realise that impersonal ideal; but, as that cannot be, it is absolutely necessary for the vast majority of human beings to have a personal ideal; and no nation can rise, can become great, can work at all, without enthusiastically coming under the banner of one of these great ideals in life. Political ideals, personages representing political ideals, even social ideals, commercial ideals, would have no power in India. We want spiritual ideals before us, we want enthusiastically to gather round grand spiritual names. Our heroes must be spiritual. Such a hero has been given to us in the person of Ramakrishna Paramahamsa. If this nation wants to rise, take my word for it, it will have to rally enthusiastically round this name. It does not matter who preaches Ramakrishna Paramahamsa, whether I, or you, or anybody else. But him I place before you, and it is for you to judge, and for the good of our race, for the good of our nation, to judge now, what you shall do with this great ideal of life. One thing we are to remember that it was the purest of all lives that you have ever seen, or let me tell you distinctly, that you have ever read of. And before you is the fact that it is the most marvellous manifestation of soul-power that you can read of, much less expect to see. Within ten years of his passing away, this power has encircled the globe; that fact is before you. In duty bound, therefore, for the good of our race, for the good of our religion, I place this great spiritual ideal before you. Judge him not through me. I am only a weak instrument. Let not his character be judged by seeing me. It was so great that if I or any other of his disciples spent hundreds of lives, we could not do justice to a millionth part of what he really was. Judge for yourselves; in the heart of your hearts is the Eternal Witness, and may He, the same Ramakrishna Paramahamsa, for the good of our nation, for the welfare of our country, and for the good of humanity, open your hearts, make you true and steady to work for the immense change which must come, whether we exert ourselves or not. For the work of the Lord does not wait for the like of you or me. He can raise His workers from the dust by hundreds and by thousands. It is a glory and a privilege that we are allowed to work at all under Him. From this the idea expands. As you have pointed out to me, we have to conquer the world. That we have to! India must conquer the world, and nothing less than that is my ideal. It may be very big, it may astonish many of you, but it is so. We must conquer the world or die. There is no other alternative. The sign of life is expansion; we must go out, expand, show life, or degrade, fester, and die. There is no other alternative. Take either of these, either live or die. Now, we all know about the petty jealousies and quarrels that we have in our country. Take my word, it is the same everywhere. The other nations with their political lives have foreign policies. When they find too much quarrelling at home, they look for somebody abroad to quarrel with, and the quarrel at home stops. We have these quarrels without any foreign policy to stop them. This must be our eternal foreign policy, preaching the truths of our Shâstras to the nations of the world. I ask you who are politically minded, do you require any other proof that this will unite us as a race? This very assembly is a sufficient witness. Secondly, apart from these selfish considerations, there are the unselfish, the noble, the living examples behind us. One of the great causes of India's misery and downfall has been that she narrowed herself, went into her shell as the oyster does, and refused to give her jewels and her treasures to the other races of mankind, refused to give the life-giving truths to thirsting nations outside the Aryan fold. That has been the one great cause; that we did not go out, that we did not compare notes with other nations — that has been the one great cause of our downfall, and every one of you knows that that little stir, the little life that you see in India, begins from the day when Raja Rammohan Roy broke through the walls of that exclusiveness. Since that day, history in India has taken another turn, and now it is growing with accelerated motion. If we have had little rivulets in the past, deluges are coming, and none can resist them. Therefore we must go out, and the secret of life is to give and take. Are we to take always, to sit at the feet of the Westerners to learn everything, even religion? We can learn mechanism from them. We can learn many other things. But we have to teach them something, and that is our religion, that is our spirituality. For a complete civilisation the world is waiting, waiting for the treasures to come out of India, waiting for the marvellous spiritual inheritance of the race, which, through decades of degradation and misery, the nation has still clutched to her breast. The world is waiting for that treasure; little do you know how much of hunger and of thirst there is outside of India for these wonderful treasures of our forefathers. We talk here, we quarrel with each other, we laugh at and we ridicule everything sacred, till it has become almost a national vice to ridicule everything holy. Little do we understand the heart-pangs of millions waiting outside the walls, stretching forth their hands for a little sip of that nectar which our forefathers have preserved in this land of India. Therefore we must go out, exchange our spirituality for anything they have to give us; for the marvels of the region of spirit we will exchange the marvels of the region of matter. We will not be students always, but teachers also. There cannot be friendship without equality, and there cannot be equality when one party is always the teacher and the other party sits always at his feet. If you want to become equal with the Englishman or the American, you will have to teach as well as to learn, and you have plenty yet to teach to the world for centuries to come. This has to be done. Fire and enthusiasm must be in our blood. We Bengalis have been credited with imagination, and I believe we have it. We have been ridiculed as an imaginative race, as men with a good deal of feeling. Let me tell you, my friends, intellect is great indeed, but it stops within certain bounds. It is through the heart, and the heart alone, that inspiration comes. It is through the feelings that the highest secrets are reached; and therefore it is the Bengali, the man of feeling, that has to do this work. — Arise, awake and stop not till the desired end is reached. Young men of Calcutta, arise, awake, for the time is propitious. Already everything is opening out before us. Be bold and fear not. It is only in our scriptures that this adjective is given unto the Lord — Abhih, Abhih. We have to become Abhih, fearless, and our task will be done. Arise, awake, for your country needs this tremendous sacrifice. It is the young men that will do it. "The young, the energetic, the strong, the well-built, the intellectual" — for them is the task. And we have hundreds and thousands of such young men in Calcutta. If, as you say, I have done something, remember that I was that good-for-nothing boy playing in the streets of Calcutta. If I have done so much, how much more will you do! Arise and awake, the world is calling upon you. In other parts of India, there is intellect, there is money, but enthusiasm is only in my motherland. That must come out; therefore arise, young men of Calcutta, with enthusiasm in your blood. This not that you are poor, that you have no friends. A who ever saw money make the man? It is man that always makes money. The whole world has been made by the energy of man, by the power of enthusiasm, by the power of faith. Those of you who have studied that most beautiful ail the Upanishads, the Katha, will remember how the king was going to make a great sacrifice, and, instead of giving away things that were of any worth, he was giving away cows and horses that were not of any use, and the book says that at that time Shraddhâ entered into the heart of his son Nachiketâ. I would not translate this word Shraddha to you, it would be a mistake; it is a wonderful word to understand, and much depends on it; we will see how it works, for immediately we find Nachiketa telling himself, "I am superior to many, I am inferior to few, but nowhere am I the last, I can also do something." And this boldness increased, and the boy wanted to solve the problem which was in his mind, the problem of death. The solution could only be got by going to the house of Death, and the boy went. There he was, brave Nachiketa waiting at the house of Death for three days, and you know how he obtained what he desired. What we want, is this Shraddha. Unfortunately, it has nearly vanished from India, and this is why we are in our present state. What makes the difference between man and man is the difference in this Shraddha and nothing else. What make one man great and another weak and low is this Shraddha. My Master used to say, he who thinks himself weak will become weak, and that is true. This Shraddha must enter into you. Whatever of material power you see manifested by the Western races is the outcome of this Shraddha, because they believe in their muscles and if you believe in your spirit, how much more will it work! Believe in that infinite soul, the infinite power, which, with consensus of opinion, your books and sages preach. That Atman which nothing can destroy, in It is infinite power only waiting to be called out. For here is the great difference between all other philosophies and the Indian philosophy. Whether dualistic, qualified monistic, or monistic, they all firmly believe that everything is in the soul itself; it has only to come out and manifest itself. Therefore, this Shraddha is what I want, and what all of us here want, this faith in ourselves, and before you is the great task to get that faith. Give up the awful disease that is creeping into our national blood, that idea of ridiculing everything, that loss of seriousness. Give that up. Be strong and have this Shraddha, and everything else is bound to follow. I have done nothing as yet; you have to do the task. If I die tomorrow the work will not die. I sincerely believe that there will be thousands coming up from the ranks to take up the work and carry it further and further, beyond all my most hopeful imagination ever painted. I have faith in my country, and especially in the youth of my country. The youth of Bengal have the greatest of all tasks that has ever been placed on the shoulders of young men. I have travelled for the last ten years or so over the whole of India, and my conviction is that from the youth of Bengal will come the power which will raise India once more to her proper spiritual place. Ay, from the youth of Bengal, with this immense amount of feeling and enthusiasm in the blood, will come those heroes who will march from one corner of the earth to the other, preaching and teaching the eternal spiritual truths of our forefathers. And this is the great work before you. Therefore, let me conclude by reminding you once more, "Arise, awake and stop not till the desired end is reached." Be not afraid, for all great power, throughout the history of humanity, has been with he people. From out of their ranks have come all the greatest geniuses of the world, and history can only repeat itself. Be not afraid of anything. You will do marvellous work. The moment you fear, you are nobody. It is fear that is the great cause of misery in the world. It is fear that is the greatest of all superstitions. It is fear that is the cause of our woes, and it is fearlessness that brings heaven even in a moment. Therefore, "Arise, awake, and stop not till the goal is reached." Gentlemen, allow me to thank you once more for all the kindness that I have received at your hands. It is my wish — my intense, sincere wish — to be even of the least service to the world, and above all to my own country and countrymen.